EPISODE #3 of the TEEN PODCAST is here! Want to help us with our next podcast? 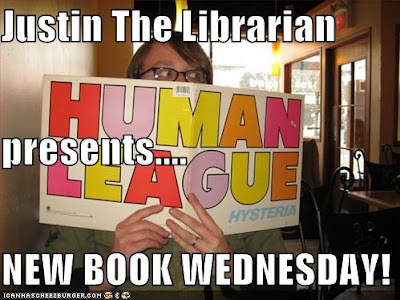 We need you to help review books, music, DVD's or just talk about some interesting things. We here at the library just want you to be part of the experience! 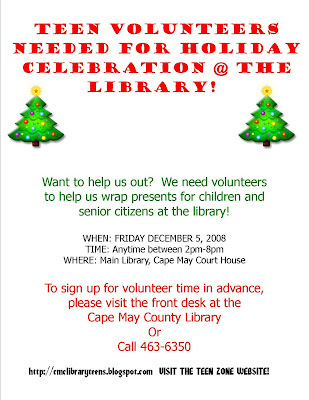 Happy Holidays from myself and the rest of the Cape May County Library Staff. The Teen Zone Blog is going to be going on a little hiatus, but we'll be back on a regular basis on Monday January 5th 2009 with a BRAND NEW FEATURE for our Teen Zone Blog! ALSO! 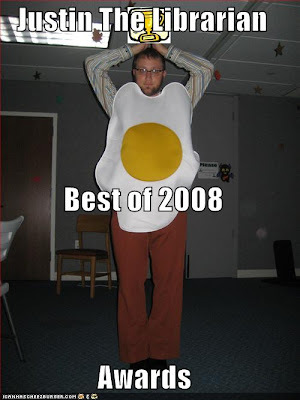 Check back on Monday December 29th 2008 for a BRAND NEW END OF THE YEAR PODCAST! EPISODE #2 of the TEEN PODCAST is here! In this episode, we pit PAPER TOWNS by John Green against THE HUNGER GAMES by Suzanne Collins in our first ever BOOK THUNDERDOME! -You have to pick something that's in our Teen Zone at any of the libraries in Cape May County. It doesn't matter if the book/DVD/CD is old or new. Just as long as it's in our Teen Room and you got a chance to read/watch/listen to the item in 2008! 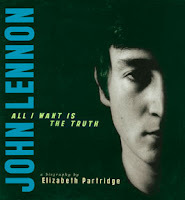 -What are some of your favorite books/DVD's/CD's of 2008? Reply to this post and let us know! Need a new Teen Book to read? CHECK BACK HERE IN FOUR DAYS (DECEMBER 22) FOR EPISODE 2 OF THE TEEN PODCAST! CHECK BACK HERE IN FIVE DAYS (DECEMBER 22) FOR EPISODE 2 OF THE TEEN PODCAST! After doing a podcast (which will be posted on December 22nd! 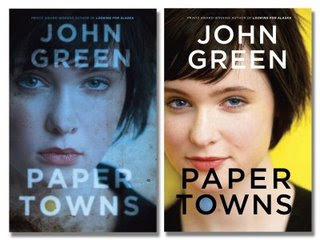 -Justin) on the subject of Paper Towns, which I had not yet read though my friends insisted it was one of the best they've read in a while, I decided I should give it a try. In the beginning, it was a fast-paced, adventurous novel, with obvious foreshadowing suggesting a seperation between characters. The characters (or at least one of them) seemed to be a spontaneous whirlwind of fairly illegal excitement that seems slightly irrational. The main character, Quentin, is surprised that the mysterious, amazing Margo chooses him to come with her on her night of mischief, revenge, and fun. He's not quite so surprised that she does not show for the next few days- it's not the first time she's gone off on some trip and came back with stories about running off to Mississippi, or the circus, etc. Only later, when a detective and her parents come to question Quentin, is the phrase "runaway" actually used. However, it becomes clear that Margo hasn't the happy lifestyle at home that she longs for, so of course it isn't the first time she's gone off on her own to get away from it. And it's also not the first time she's left vague clues as to her whereabouts. However, it is the first time she's left them for Quentin.The middle of the story is made up of Quentin's obsessive hunt for Margo. Becoming more and more worried, Quentin considers whether Margo's clues meant to lead him to her- or to her body. When he finally finds evidence of where she has gone, he is looking at a 19 hour drive, not accounting for traffic, to get to a fictional place in less than 21 hours. His best friends, Radar and Ben, plus Ben's girlfriend and Margo's best friend Lacey, insist, last-minute, on skipping their own graduation to come with Quentin. The next part of the story is made up of the four highly caffeinated teenagers on an extremely rushed road trip. This would be the hilarious part; however, I refuse to spoil the jokes for you, since some of them were indeed spoiled for me, which made them much less funny. All in all, I don't think I have anything bad to say about the book, except that the middle was a downer. If you plow through it, you get right to the end, which is quite an upper. This book has many deep insights about people and personalities, particularly of teens. It's not a typical novel by any means, however it is what a typical teen novel should be. Thanks to Beth S. for the Review! CHECK BACK HERE IN SIX DAYS (DECEMBER 22) FOR EPISODE 2 OF THE TEEN PODCAST! Need help with your Spanish homework? Want to learn how to say "I enjoy eggs for breakfast! *" in Russian? Try PROMT! 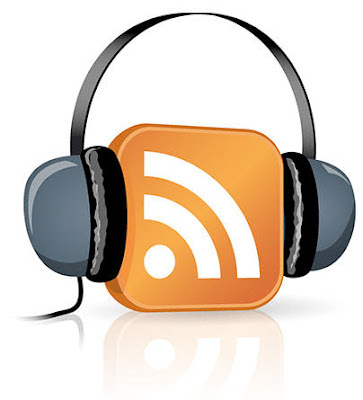 CHECK BACK HERE IN ONE WEEK (DECEMBER 22) FOR EPISODE 2 OF THE TEEN PODCAST! TWO REVIEWS! The first is by Miss Vicki, the Children's Librarian at the Cape May County Library. Up after that is a review from one of our local teens, Beth. The Hunger Games is an intense work of teen survival fiction. Reading this book, I could instantly recognize the many sources that seem to have inspired this book: Survivor, various Greek Myths (particularly Theseus in the Labyrinth), Roman Gladiator games, and Battle Royale for those reading this over 17. This book is brutal. The teens do die, some in horrible ways. Suzanne Collins doesn't mull on gory details, thankfully, but each death has an emotional resonance that really reflects the WRONGNESS of the situation. After all, not only are children and teens forced to fight each other, they are doing so live on television, while the whole country watches. It's entertainment to those not participating. This is reality tv of the future. I enjoyed reading this book. It has many themes that can be discussed for hours, making it ideal for book clubs and schools, as well as individual reading. 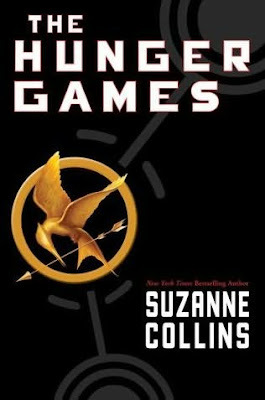 Katniss is a fully developed main character, and I enjoyed her perspective on the events that occurred within the book. She is not without flaws, but she is a very strong and resourceful person. I found myself admiring her survival intelligence. The world of Panem is very well describe and many images still haunt me. However, I did not know ahead of time that The Hunger Games is part of a planned trilogy, so I was really annoyed by the "To be continued" at the end of the book. There are a few loose ends and honestly, I have no idea where the second book is going to take me. I enjoyed The Hunger Games so much, though, that I'll definitely tune in for Part Two. I was excited to read this book based on advance reviews. I wasn't disappointed one smidging bit. I devoured this book in 4 hours, then immediately convinced my 14 year old sister to start reading it. She read 50 pages in the time it took for me to have a cup of tea. I recommend this for teens that enjoy books like The Giver by Lois Lowry, or any of the works I've mentioned above. It will also be appreciated by those who question the current Reality TV trend, or by those who enjoy survival fiction, like the Island series by Gordon Korman. *totalitarian state-n. A form of government that controls many aspects of its peoples' lives, including what they should say, think and do. Freedom of speech doesn't exist in these governments. **dystopian-adj. highlighting human misery. Dystopian books talk about poverty, oppression, and violence usually caused by a totalitatian state. The Hunger Games Review by Beth S.
Okay, I'll admit it- the only reason I chose to read (or, rather, insisted the library get for me) the book 'The Hunger Games', by Suzanne Collins, was because Stephenie Meyer, best-selling author of the 'Twilight' series, highly recommended it. And I must say, although I read it in almost one shot, I wasn't quite as highly impressed as my favorite author had been. 'The Hunger Games' is a futuristic, somewhat sci-fi story. It takes place in Panem, which is the country that has replaced the North American countries. Every year, the government of Panem puts on the show known as the Hunger Games, which can be compared to a demented form of the reality show 'Survivor'. 24 teens, between the ages of 12 and 18, are placed in the wilderness with only their own means of survival. The catch? Only one will be permitted to leave the arena. The rest must kill each other. The Games are supposedly put on to remind the people of Panem that the government has complete control over them, and can slaughter their children for no reason other than entertainment. I suspected an alterior motive, until I realized that the author would give none. The main character, Katniss, was not chosen for the Hunger Games; her little sister, Prim, was. However, Katniss refused to see her little sister die in the Games, and volunteered in her place. Her opponent from her district is Peeta, a boy who once helped her out when she was hopeless and starving. In fact, the Games don't seem to be aptly named, since Katniss eats better during her time in the arena than she did when she was a child. Food even falls from the sky, if she's in bad need of it, if her sponsers are willing to send her some. Most of the contestents are used to surviving on very little food, since the government doesn't do much for the care of the poorer districts.The book isn't very eloquent. I could pick on sentence structure, but that doesn't honestly bother me too much. It's written more like a continuous train of thought than like a novel, which makes it simple to read, and somewhat fast-paced. Thank you Beth and Vicki! 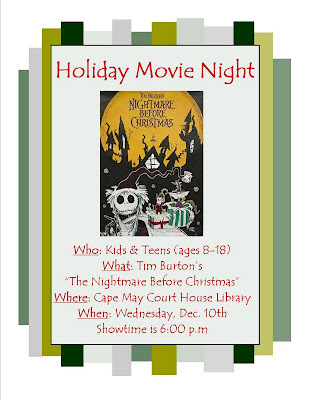 Come watch The Nightmare Before Christmas at the library! Everyone is invited, so if you've got a younger sibling, bring them along! 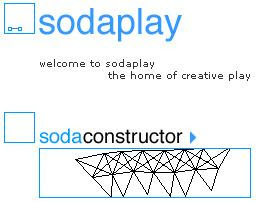 Build stuff and have fun! Holiday Celebration at the Library! I hope everyone had a great time at the show. I know I did. Many thanks to The Moaning Myrtles for putting on a great show.